Washed Away: Kenney Dam flooded Chelsetta lands and villages to produce hydropower for Alcan's (now Rio Tinto's) aluminium smelter. In 1950 the government invited Alcan to explore the potential of sites around the country for hydroelectricity. In 1928, the provincial government of British Columbia sent engineers to study the lakes in Northern BC to produce an estimate as to how much hydro power could be obtained from the region. The government then invited Alcan (the Aluminum Company of Canada), now Rio Tinto, to develop the region and mine the ore. In 1948, in response to the invitation, Alcan sent experts to study the region. Two years later, Alcan and the provincial government signed an agreement that would last 44 years. This agreement essentially gave the land rights to Alcan for them to produce low cost hydroelectricity for the aluminum smelter they were going to build as well as purchase additional land at hugely reduced prices. Along with the smelter, the project would include a dam and a reservoir. Tinto Alcan smelter in Kitimat. Kemano hydroelectric station is the power generating station for Kitimat aluminum smelter and to this day “remains the largest high pressure hydro generating facility in North America,” by generating power with the least amount of water possible (Rio Tinto website). Not only is the generating station one of the largest of its kind but so is the aluminum smelter. Kemano hydro generating power produces energy for the smelter which in turn contributes to the economy and communities of Northern British Columbia. However, the hydro generating station produces more energy than the smelter requires, with a capacity of 896 megawatts. The remaining power from the generating station is provided to BC Hydro who then distributes it to communities along the Highway 16 West. 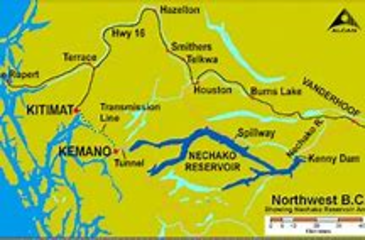 Moving forward 62 years to 2014, another expansion project for Kenney Dam and Kemano generating station is being proposed. This expansion project would complete Tunnel two (T2) of which construction had never been completed during the initial construction of the project back in the 1950s. The expansion project would not only complete Tunnel two (T2) but it would also add a connection between Tunnel one (T1) and Tunnel two (T2). Project Details The original project was approved and completed in the 1950s. There was an expansion project applied for in 2014. This project consisted of the completion of Tunnel two (T2) which would permit Rio Tinto to not only produce more hydroelectricity for their smelter but also permit them to temporarily close Tunnel one (T1) to administer repairs. According to Rio Tinto’s General Manager for BC Works, Gareth Manderson, Tunnel one (T1) has been assessed by five experts who estimate that the Tunnel has between a 20% and 50% chance of collapsing by 2021 and that more and more rocks are being caught in the rock trap. The rock trap is what prevents loose rocks from entering the turbines. However, without Tunnel two (T2), the only way to administer repairs would be to close the Tunnel which would cut off all power to the aluminum smelter. This project was estimated to cost approximately $473.6 million. The Tunnel when completed will be 16 km long and seeing as 8.4 km was built back in the 1950s, there is approximately 7.6 km remaining. Additionally, in favour for Rio Tinto, this expansion project does not require a surplus of water than what was allocated to them in their license. Furthermore, according to Manderson, the construction will be completed by Tutor Perini Corporation who will also refurbish the existing 8.4 km of the Tunnel. The work is estimated to start very soon (second quarter of 2018), if it has not already started and for the complete project to be completed by 2020. The company is currently waiting for a custom drill to arrive from Germany. It is expected to arrive in Fall 2018 and for the drilling to start in the winter. All of the permits and licenses have been approved and construction should begin shortly. Prior to the Alcan development, non-native settlement in the region was sparse, consisting mainly of those pioneers who moved into the region in the early 1900s .... However, the Kitimat Valley had been inhabited by the people of the Haisla nation, a Kwakiutl Indian language-group, many years prior to Alcan's arrival. Other Cultural values impacted. Cemeteries flooded and bones unearthed. Development of Alternatives There has only been one alternative proposed over the years and that was the additional spillway proposed by the Cheslatta. Unfortunately the proposal did not go very far mostly due to Rio Tinto. Hopefully in the future, this proposal will re-emerge with more success. Why? Explain briefly. This is not a success story because although steps have been made towards reconciliation no real outcome has been reached. Despite the settlement in 1993 and the agreement in 2016, more work needs to be done. The Cheslatta Carrier Nation continue to bear the brunt of the original project of the 1950s which was built without their knowledge or consultation. Their lands have been taken away from them and there is no way they can get them back. Furthermore, the agreement signed in 2016 was never examined further and I believe this is due to the change in government.